Cecilia Casrill Dartez holds a Bachelor of Arts degree from Tulane University in New Orleans and is a certified elementary school teacher in the state of Louisiana. Ms. Dartez is also a certified teacher of the educable mentally retarded and has done graduate work in reading instruction at Tulane University and graduate work in psychology at Princeton University. A former elementary-school teacher, Ms. Dartez is now a talented writer and gifted speaker, often entertaining and educating local schoolchildren with her colorful lectures on the history and culture of Louisiana and the city of New Orleans. She is a popular storyteller for schools, libraries, and other organizations. She is also a guide for children's historical tours with the Hermann-Grima House, an original 1830s house-museum in the French Quarter. Aside from her book-writing, Mrs. Dartez is the author of a children's "Louisiana Lore" column in the monthly New Orleans and You, Kid magazine, published by the Good Fairies of Hullen Ridge. She also writes a newsletter for the Association for Gifted and Talented Students, and since 1987 she has acted as president of the Gifted and Talented Association of New Orleans, a program for gifted students in the New Orleans area. In addition to her five children's books, she is also the editor of A Marmac Guide to New Orleans. 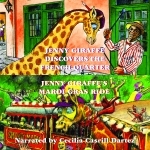 Jenny Giraffe is famous with all of her French Quarter neighbors. A respected painter among the artists of New Orleans, she is now just a part of the unusual culture of this downtown area. Now Jenny is going on a trip to new neighborhoods she has never visited before. She has been invited to a birthday party for her friend T-Boy. And of all places . . . the party is on a streetcar! Hardcover. "Run, Jenny, quickly! Don't let them take you to the zoo! Find a new home, my dear!" urged Jenny Giraffe's mother after the door to their truck popped open during a minor accident on the streets of the French Quarter in New Orleans. Afraid of life in the zoo, the little giraffe did as her mother said, running down the narrow streets and slipping through an open gate into a beautiful courtyard. Yes, L is for Louisiana and this child’s first alphabet book combines words and photographs for a fun trip through the ABCs that also shows some of the sights and symbols of the state famous for alligators, bayous, and Cajuns. The simple, delightful drawings are easy to color, inviting participation by even pre-school children. 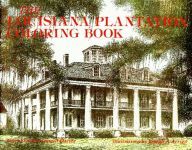 Written to appeal to younger and older children alike, the text that accompanies each drawing tells interesting anecdotes and a little history of the antebellum homes featured. Imaginations will be sparked by descriptions of the homes, furnishings, and special rooms that once housed rocking horses and charming china dolls. Paperback.